A perfectly roasted chicken is among the most satisfying of foods, the golden skin crisp and crackling, the flesh tender and moist. It’s basically a simple dish yet it intimidates far too many cooks. I was reminded of this fact on a recent getaway with two of my best friends to a house overlooking the harbor at Bodega Bay. We had stopped at a nearby fish market on our way to the house in search of seafood for that night’s dinner. But the deliveries from the local boats hadn’t arrived. So we went to the little market across the road and a whole bird beckoned from the cold case. “Let’s roast a chicken,” I suggested. My friends looked skeptical. We were here for day of hiking, watching whales, reading books and lazing around the glass-enclosed deck. We wanted to eat well but fussing with dinner was not on the agenda. “It’ll be fine,” I promised. “We’ll do it Thomas Keller’s way. It’s simple and it always works great.” My friends still looked doubtful but the shopkeeper wrapped the chicken in butcher paper and we were on our way. That evening in the kitchen, we talked cooking. One friend always roasts her chickens in a venerable clay pot. The other follows James Beards’ lead and both covers the breast with bacon and bastes with melted butter. We knew cooks who always brined their chickens before roasting and those who stuffed a mixture of herbs and softened butter under the skin. For all his fame as the chef and owner of some of the most revered restaurants in the world, Thomas Keller does none of that for his favorite simple roast chicken as described in “Bouchon” (Artisan, 2004). He starts, as we did, with a very good farm-raised chicken, dries it well, sprinkles it with kosher salt and roasts it at 450 degrees for 50 minutes to an hour. Only when the chicken comes out of the oven does he baste it with the pan juices before letting it rest for 15 minutes. Keller does not fuss. He doesn’t even baste. And the chicken is perfect every time. We ate well that evening. My one variation was to stuff the chicken’s cavity with rosemary and cut-up lemons before roasting. When it came out of the oven, I squeezed the lemon juice over the bird after spooning juices over the skin. There was only one hitch. All three of us wanted the thighs and no one was that interested in the breast, juicy as it was. We came up with an equitable split of the dark meat and the breast meat went into a salad the next day. When I got home, I decided to see if I could get such good results with just parts – primarily thighs, of course. They were terrific, too, and much more practical for my small family. We just roast the parts we prefer. Not only is chicken prepared this way flavorful and moist right out of the oven, it’s great as leftovers the next day, served cold or at room temperature. This summer I may just ditch the fried chicken in favor of roasted parts for Sunday lunch or a picnic at the beach. Preheat oven to 450 degrees. Pat chicken dry with paper towels, sprinkle skin side generously with salt and season with pepper. Arrange rosemary branches on the bottom of a large cast iron skillet or oven-safe saute pan. Distribute lemon quarters around the pan. Place chicken parts, skin side up, over rosemary and lemons. Roast for about 30 minutes, until the juices run clear when the chicken is pricked (about 160 degrees on an instant read thermometer). Remove chicken from oven and immediately spoon pan juices over the parts. After the chicken has cooled for a few minutes, squeeze juice from the roasted lemons over the skin. Let rest 10 minutes in all and serve. Now why didn’t I think of that. 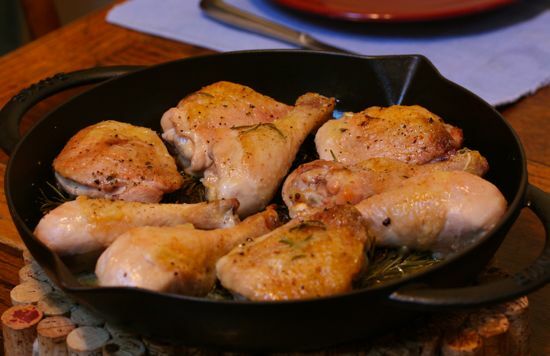 I always prepare my whole chickens that way using branches from my huge rosemary bush and lemon (I do think it’s a modification of Julia Child who only does high heat for first 15 minutes rotating the chicken side to middle to side which also makes sure the leg joints get done and that the breast stays juicy) – now I can do it with just thighs. Thanks, Aleta. Wow, this looks yummy and sounds simple. My favorite combination! I really like chickens. I con not wait to try it. This summer I may just ditch the fried chicken in favor of roasted parts for Sunday lunch or a picnic at the beach. When I got home, I decided to see if I could get such good results with just parts â€” primarily thighs, of course.